check www.belval.lu to see what horror future plans the imbeciles have planned from above. When will they learn that cities cannot be planned, they need to grow organically. Many people have deceived and will continue to profit. The planners must be forced to live there themselves. From an ethical point of view, the Group aims at providing its customers with always better and more reliable products and services; improving the well-being of all its employees sharing common values within the ARBED Group and fostering personal relations within the Group; guaranteeing equitable treatment to all its shareholders; respecting the customs of each country without any national bias and adopting as an international Group a responsible and respectful attitude towards its environment. ARBED S.A., based in the Grand Duchy of Luxembourg, heads an international group of 189 companies engaged in every aspect of iron and steel production from the mining process to the production of highly sophisticated finished goods. It can be seen as both product and agent of the economic revolution that over the last century has transformed Luxembourg from a small agricultural nation into a major industrial power with its activities centered on the great iron- and steel-producing complexes in the southwest of the country. The company is comprised of eight business sectors: flat products, wire drawing, long products, engineering, stainless steel, copper foil, sales and trading, and its Brazilian operations. Three-quarters of the group's turnover is accounted for by steel production and related activities. Though it has undergone extensive personnel reductions in the 1980s and 1990s, ARBED remains the Grand Duchy's largest industrial employer. It ranks among Europe's largest iron- and steel-producing groups, with an annual output of more than 11.75 million metric tons. Iron has a long history in the area that now constitutes the Grand Duchy of Luxembourg. It was mined by the Celts, then later by the Romans, not only from alluvial deposits in the valleys of the rivers Eisch and Alzette but also from minette, found in the southwest of the region, which was low in iron content and high in phosphorus and whose rediscovery in the mid-19th century gave an impetus to the modern industry and decided its location. Traces have been found in the canton of Esch of underground mining by the Romans, who made charcoal from the wood of local forests to smelt the ore in primitive furnaces, obtaining the metal they then fashioned into arms and armor. After the Germanic invasions the recovery of minette, for which underground mining skills were needed, died out. Iron production based on alluvial ore persisted in the region as a domestic craft, providing household and farm implements during the succeeding centuries as the region slowly and intermittently evolved, despite periods of anarchy, civil war, plague, misrule, and invasion, toward a sense of identity. Smelting plants and forges were set up near sources of charcoal and water power, the first very small-scale blast furnace making its appearance in the region in 1564. Iron- and steel-making emerged on an industrial scale in the middle of the 19th century, in the region that had been the Grand Duchy since 1815. It is there that the origins of ARBED lie, although the company itself did not come into being until 1911. When the years of adversity came to an end, there were Luxembourgers ready to seize the country's chance at prosperity--businessmen with the drive and confidence to adapt Luxembourg's natural, human, and technological resources to the huge but inconstant market for iron and steel opening up at home and especially abroad, as industrialization gathered pace. CLICK ON A PICTURE TO VIEW IT BIG !! Several circumstances converged to favor an upswing in iron and, increasingly, in steel production: the expanding use of the steam engine which allowed greater freedom in siting and a larger scale of operations; the rediscovery in south Luxembourg of minette deposits that would not be exhausted until 1981; the construction of railway lines linking Luxembourg with the European systems; Luxembourg's entry in 1842 into the German customs union, the Zollverein; and the invention in 1878 by S.G. Thomas and P. Gilchrist of the Thomas-Gilchrist--or Thomas, or basic Bessemer-process, an improvement of the Bessemer converter, permitting elimination of the phosphorus that had hitherto presented problems in the smelting of the phosphoric minette ores of Luxembourg and Lorraine. When, following lengthy initiatives by Émile Mayrisch and Gaston Barbanson, Aciéries Réunies de Burbach-Eich-Dudelange was formed in 1911, it was on foundations laid earlier by a number of iron and steel manufacturers. 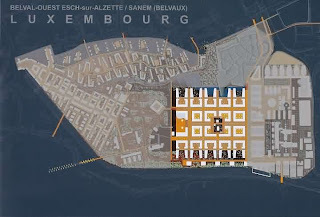 The latter were mainly Luxembourgers, linked by several family connections as well as by business interests. They had built up three companies, whose resources were now to be combined and directed to modern large-scale production of steel and steel products centered on Esch-Schifflange. The first of the three companies, already operating and cooperating in close proximity to each other in the southwest of the Grand Duchy and in nearby Germany and Lorraine, was the Forges d'Eich--Le Gallais, Metz et Cie, founded in 1838. It had originated in 1838 when three brothers, Charles, Norbert, and Auguste Metz, who played major roles in Luxembourg industry, politics, and journalism, set up a limited partnership, Auguste Metz et Cie, known since 1865 as the Société des Forges d'Eich--Metz et Cie. In 1879 this company had acquired a license to use the Thomas-Gilchrist dephosphorization process. Its main works were at Dommeldange and Esch-Schifflange, the latter a joint venture started in 1871 by Norbert Metz and Victor Tesch, his cousin by marriage. The second company, Société Anonyme des Mines du Luxembourg et des Forges de Sarrebruck, had been created in 1856 by Victor Tesch and other Belgians of Luxembourg origin. Its coke ovens and blast furnaces were at Burbach in Germany, northeast of Saarbrücken. The third company, the Société Anonyme des Hauts Fourneaux et Forges de Dudelange, had been established in 1882 by the first two companies in order to exploit the Thomas-Gilchrist process in a steel plant at Dudelange, where the first charge of Thomas steel was blown in 1886. In 1911 the first two companies were dissolved and their assets transferred to the third, whose title was changed to Aciéries Réunies de Burbach-Eich-Dudelange S.A. (ARBED). By 1911 the first company's original Eich works were of minor importance. 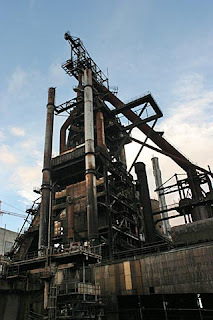 At Esch-Schifflange it had four blast furnaces, two of them belonging to the Société des Mines du Luxembourg et de Sarrebruck, and its works at Dommeldange had three blast furnaces and four electric furnaces. The second company's Burbach plant had eight blast furnaces, a steel works, and rolling mills. The third company's property at Dudelange comprised six blast furnaces, a steel works, and rolling mills. All three constituent companies also brought with them the iron ore mining concessions they held in Luxembourg and Lorraine. Between them the companies produced cast iron and Thomas steel; laminated items--semi-finished goods; and sections, girders, rails, and flat bars. With Émile Mayrisch, managing director from 1897 of the Société des Mines du Luxembourg et des Forges de Sarrebruck, as overall technical director of ARBED, the new company proceeded rapidly with its plans for modernization, vertical integration, and expansion. In 1912 ARBED's annual output of crude steel was around 824,000 tons. Old furnaces, blowers, and other installations were being refurbished or replaced, and new, more efficient equipment was being brought in, notably equipment which utilized waste gases from smelting to power other processes further down the line. In 1913 new installations, including three blast furnaces, started up at the company's Esch-Schifflange and Esch-Belval works. In April of the same year ARBED protected its coke supplies by forming a contractual association with the Eschweiler collieries--Eschweiler Bergwerks-Verein AG (EBV)--near Aachen, Germany. This move was in keeping with a policy of cooperation with other European firms, designed to ensure ARBED's supplies of raw materials--ore, coal, and coke - well as to find customers for its crude, semi-finished, and finished products and to extend its product range. In 1913 ARBED joined with a Belgian cement-making firm to start a new company, later to become the Société Anonyme des Ciments Luxembourgeois, for their mutual advantage; in exchange for a site near the Esch-Schifflange works, together with a supply of slag and electric current, ARBED would receive cement for its own use at a reduced price. In 1919, together with the French company Schneider et Cie, ARBED took over all the Luxembourgian and Lorraine iron mines, iron and steel works, including Belval, and wiredrawing works that had belonged before the war to the German company Rhein-Elbe Gelsenkirchener Bergwerks A.G., and set up two linked companies, the Société Métallurgique and the Société Minière des Terres Rouges, of which the first, the Société Métallurgique des Terres Rouges--at Esch-Belval--was to be absorbed in 1937 by ARBED, who acquired a majority holding in the second, the Société Minière des Terres Rouges, in 1954. ARBED was recovering from the setback to its ambitions suffered during World War I. As so often over the centuries, Luxembourg's geographical location had placed it between the hammer and the anvil of contending foreign powers. In spite of its neutral status, guaranteed since 1867, it was invaded by German troops as soon as war broke out, and occupied for the duration. The Grand Duchy has historic, linguistic, and commercial affinities with Belgium and France and with Germany, but the German invasion settled the question of where loyalties should lie in 1914. ARBED's situation was made particularly painful by its ownership of works--Burbach and Hostenbach--in enemy territory. Company policy was to lend as little comfort as possible to the occupying power, while safeguarding as far as possible the survival and future prospects of ARBED and its employees. In the Grand Duchy, after a brief initial shutdown, which the company had offered to prolong if the Luxembourgian government wished, production was resumed by the blast furnaces--four at Dudelange, one at Esch-Schifflange, and one at Dommeldange. Production followed in the steelworks and rolling mills of Dudelange and Esch-Schifflange and in the electric steelworks at Dommeldange. There were shortages of raw materials--fuel, manganese, and lubricants--and of staff, as well as of food. At one point, in 1917, the Germans occupied the factories in an effort to put down a protest strike by hungry workers. The Saar works, Burbach and Hostenbach, were also kept in operation while hostilities lasted, in spite of reduced supplies and the progressive call-up of staff to the German army. Over the war period, in spite of the new installations, ARBED's total monthly steel output dropped from nearly 87,000 tons in July 1914 to just under 50,000 tons in October 1918. Undercapacity persisted after the war, with continuing fuel and transport problems, plus commercial difficulties arising from Luxembourg's economic isolation, which ended in 1922 with the treaty of economic union with Belgium. 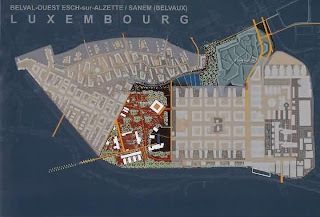 Long-term plans proceeded, including the linkage of all the plants located at Esch-sur-Alzette into one huge complex served by its own railway, completed in 1927; by gas-pipes; and by electric cables. In 1920 ARBED set up a company, the Comptoir Métallurgique Luxembourgeois (COLUMETA), to deal with the sales of its wide range of products. This branch of the group's activities was to flourish and multiply worldwide, with most of the company's sales directed abroad. In 1976 the name COLUMETA was changed to TradeARBED; this company has foreign subsidiaries in 50 foreign countries and in every continent. Also in 1920, ARBED acquired holdings in the German firm of Felten & Guilleaume, makers of wires, cables, and electrical apparatus; TAMET (Argentina), which produced metal tubes, frames, and bolts; Paul Wurth (Luxembourg) metal constructions; and the Helchteren-Zolder collieries in Belgium. In 1922 it bought a holding in the Belgian nail-making and wire-drawing Clouterie et Tréfilerie des Flandres. After the death in a motor accident of Émile Mayrisch in 1928, the inter-war technical development of the group's mines and factories was led by Aloyse Meyer. The iron mines in Luxembourg and Lorraine were mechanized and modernized. At the steel works, major additions and improvements were made to installations and processes, with constant adjustments to methods of reducing impurities that were present in the ores or were introduced at the manufacturing stage. Production rose steeply, with peaks in 1929 and 1937. Meanwhile the company continued to provide for the welfare of its employees as it had from the beginning, through its own social services--including training, insurance, pensions, bonuses, and help with housing. Responsibility for some of these services has, of course, been taken over gradually by the state, pensions, for example, in 1931, and family allowances in 1947. In World War II, the Grand Duchy was occupied again, first by German troops, then from August 1940 to September 1944 by Nazi officials. Based on its World War I experience, ARBED had earlier moved out key officials and documents to places of safety, and had obtained legal powers to arrange for its operations to be directed from abroad. Once more production was prudently maintained, at a reduced level, by those who had to stay, working in the face of prolonged hardships and shortages. Output, diminished drastically during the war, ceased entirely for 11 months after the occupation and recovered only slowly from the fuel shortage and transport difficulties that were part of the aftermath of conflict. It was not until 1951 that ARBED reached full capacity once more and achieved production figures--nearly two million tons--that were higher than those of the previous peak years 1929 and 1937. In the 1950s and 1960s ARBED continued its policy of development and integration within the group. The group expanded through acquisitions and participations at home and abroad--in Europe and South America- ai med at securing its supplies and diversifying its steel production. It continued moving downstream in advance of some of its larger and better-known European competitors. In 1953 it absorbed the Clouterie et Tréfilerie des Flandres and in the following year acquired a majority holding in the Société Minière des Terres Rouges. 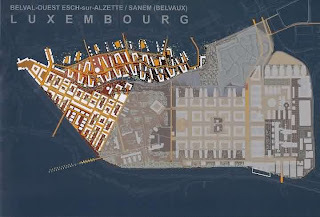 In 1962 it was a major participant in the setting-up of the Sidérurgie Maritime company (SIDMAR) to construct an important complex, with integrated steelworks and marine terminal, on the Belgian coast. In 1965 ARBED acquired a major holding in the Société Anonyme des Hauts Fourneaux et Aciéries de Differdange-St. Ingbert-Rumelange (HADIR), a consortium of Luxembourgian, French, and Belgian companies that had been developing since 1896. The consortium was absorbed completely by ARBED in 1967. HADIR's Differdange works augmented ARBED's Esch complex. In 1911 Differdange had begun to roll Grey beams. In 1959 ARBED's Dudelange works had started producing steel using the LD-AC (Linz-Donavitz-ARBED-Centre) process. ARBED's wire-works were grouped in 1968 to form a new company, ARBED-Felten & Guilleaume Tréfileries Réunies, which, with other later wire-making acquisitions, was to become TrefilARBED in 1974. The 1970s saw the extension of ARBED's activities in several other directions: refractory products; reinforcing wires for car tires; mining operations in Brazil, the United States, and Korea; and mechanical engineering and steel construction. At the end of the 1970s ARBED accounted for a quarter of the Grand Duchy's gross national product. 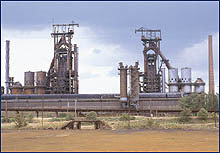 Two important structural measures taken in advance of the world steel crisis of the mid-1970s and 1980s were the establishment of the ARBED Research Centre in 1971 and of ARBED Finance S.A. in 1972, a holding company designed to provide finance for the group. The acronym ARBED S.A. was adopted in 1978 as the company's official name. In 1975 the Luxembourgian economy went into a long recession caused by many factors: the continuing effects of the 1973 world oil crisis; strengthening foreign competition; inflation; rising wages; fluctuating foreign currencies; and depletion of the country's iron ore. ARBED's crisis lasted until 1984, and ever since then ARBED, like all other European steelmakers, has had to take account of falling demand for steel, increasing use of plastics, growing competition from the developing world, uncertainties about the new eastern European markets, and currency fluctuations. In the 1970s and 1980s overcapacity and financial losses called for vigorous adaptation--organizational, financial, and technological. Competitiveness had to be improved. Over the crisis period ARBED economized by reducing its debts, increasing its share capital, and shedding, without sackings, more than half of its work force, some being redeployed in new industries, others taking the early retirement, at 57 years of age, imposed on steelworkers by the government in 1980. The company pursued a policy of rationalization. In 1984 the blast furnaces, the steelmaking facilities, and the hot rolling mill at Dudelange closed down. At the same time ARBED needed to invest in new equipment and implement the results of technological research. In 1980 the first continuous caster was commissioned at Esch-Schifflange, and in 1981 the first continuous annealing line went into service at SIDMAR's plant in Ghent. For a time ARBED was helped by the European Economic Community steel quota system. 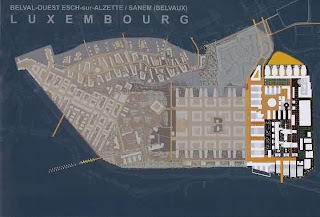 The Luxembourg government provided some financial support on the restricted scale possible for a small country. When by 1983 ARBED could see the tide beginning to turn again, it was largely the result of the group's own efforts under the chairmanship of Emmanuel Tesch--a descendant of Victor Tesch, one of ARBED's founders. By the end of its boom year, 1989, helped by the peak in the post-crisis upturn of the European steel market, ARBED was able to pay its shareholders their first dividend since 1975. 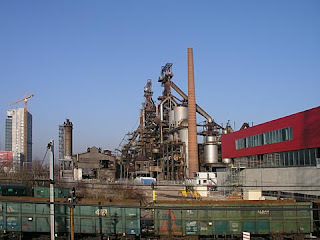 In the first years of the 1980s the Luxembourgian steel industry had moved back to closer cooperation with Belgium. In 1987 ARBED acquired a three percent share in the Société Générale de Belgique. This holding company holds 25 percent of ARBED's shares while the government of Luxembourg holds 32 percent. In 1983 ARBED began to detach itself from its group holdings in German steel companies. In 1988 it ended a 75-year association with its traditional supplier of metallurgical coke when Eschweiler Bergwerks-Verein (EBV) joined Ruhrkohle AG. Ruhrkohle, however, is contracted to provide the same service until the beginning of the next century. In the boom year 1989, ARBED decided to double the capacities of the steel processing works at Galvalange, which produces goods for the construction industry--roofing, flashing, fencing--and for the car and goods vehicle industry--exhaust parts, cabs, and trailers -- as well as garden tools and parts for domestic appliances such as microwave ovens, refrigerators, and air-conditioners. Along with the European steel industry in general, ARBED faced a number of pitfalls in the early 1990s. A recession combined with sluggish demand and heavy competition from low-priced imports to force prices steadily downward throughout the first half of the decade. Industrywide overcapacity and low productivity only exacerbated these problems. ARBED met these challenges with economical new production methods, alliance-building, and large reductions in employment levels. Negotiations began in the summer of 1990 between ARBED and the large Belgian steel producer Cockerill Sambre for a partial merger that would pool most of the flat steel-making capacity of Cockerill Sambre's two plants in Wallonia and of ARBED's Sidmar subsidiary in Flanders. The plan fell through at the end of the year, partly because of regional differences between Flanders and Wallonia over possible closures. The failure of this deal did not discourage ARBED from pursuing several international affiliations in the 1990s. In 1990, acting with the Japanese firm Furukawa Electric, ARBED acquired Yates Circuit Foil (USA), which specialized in copper foil and electronic circuits. And in 1991, ARBED forged a distribution pact with Europe's largest steel producer, France's Usinor Sacilor SA. With domestic coal and iron sources nearing depletion, ARBED began to wean itself from old-fashioned production methods. By mid-1997, the company had converted all its long products capacity from the traditional integrated process using pig iron to electric arc furnaces--known in the trade as minimills--using scrap steel. Since minimills required fewer personnel to produce as much steel, they also helped ARBED increase productivity. The company slashed employment levels in the early 1990s, cutting 2,700 positions in Luxembourg alone from 1996 through 1998. As was its custom, the company utilized government-funded attrition programs like early retirement, retraining, and job placement to achieve the reductions. In July 1997 ARBED became the primary shareholder in the privatization of Spain's previously government-owned Corporacion Siderurgica Integral (CSI). The Luxembourgian company offered Pta 109 billion (US$832.1 million) worth of its stock (a 9.5 percent stake) in exchange for a 35 percent share of the Spanish steelmaker. It also pledged to invest an additional Pta 156 billion (US$1 billion) in CSI's operations. The affiliation increased ARBED's annual steel output by more than one-third, to over 16 million tons per year. Although ARBED suffered a LuxFr1.2 billion (US$35 million) loss on sales of LuxFr232.2 billion (US$8.2 billion) in 1996, CEO Joseph Kinsch was optimistic about the company's future, noting growing demand, rising production, and price increases in a review of the first half of 1997. Principal Subsidiaries: ARES SA (76.29%); Armasteel Belgium SA; Armasteel SA (Belgium); Ets Durieux SA (Belgium; 80%); Ecosider SA; Europrofil Deutschland GmbH (Germany); Europrofil France SA; Europrofil SA; Flamm-Stahl GmbH (Germany); ISPC SA (85.17%); Newco Sarl & Cie Secs; Newco Sarl; ProfilARBED SA (99.99%); ProfilARBED Staalhandel BV (The Netherlands); ABC BV (The Netherlands); Anviroma NV (Belgium); Betonijzer Buigcentrale Limburg BV (The Netherlands); Borotrans Born BV (The Netherlands); Calimco BV (The Netherlands); Kielco Belgie NV (Belgium); Cogeaf BV (Belgium; 95.93%); Demanet-Cassart Aciers SA (Belgium); Ijzerhandel H. Houtappel BV (The Netherlands); ISSCO BV (The Netherlands); Kielco Belgie NV (Belgium); Kielco Nederland BV (The Netherlands); Lamot Tank-Transport NV (Belgium); Lamot Transport NV (Belgium); Leduc Trading NV (Belgium); Limbustaal BV (Belgium); Lommaert Algemene Handelsmij NV (Belgium); Lommaert Walserijprodukten BV (The Netherlands); M Soft NV (Belgium); Metalim NV (Belgium); Montan Staal BV (The Netherlands); Probat Profiel NV; Straalco Overpelt NV (Belgium); ProfilARBED Staalhandel Nederland BV (The Netherlands); STUL-Ste du Train Universel de Longwy Sa (France; 75%); Socadi; Socam Sarl; Stahlwerk Thruingen GmbH (Germany); VALPA-Valenciennes Parachevements SA (France); Brefin Verwaltungs-und Beteiligungs (Germany); Bregal-Bremer Galvanisierungs-GmbH (Germany; 50.1%); Cofrafer SA (France); Decosteel NV (Belgium); Europese Staal Prefabricatie NV Belgium); Laminoir de Dudelange SA; Sidmar NV (Belgium; 71.74%); STAHLwerke BREMEN GmbH (Germany; 67.68%); Sidcenter NV (Belgium); Sidstahl Deutschland Stahlhandels-GmbH (Germany); Sidstahl France SA (France); Sidstahl Luxembourg SA; Sidstahl NV (Belgium); Sikel NV; Al-Center NV (Belgium); Al-Fin NV (Belgium; 88.51%); ALZ Nederland BV; Albufin NV (Belgium); Arbed Americas Inc. (U.S.A.); Arkansas Steel Processing Inc. (U.S.A.); Coil-Tec Inc. (U.S.A.); Considar Inc. (U.S.A.); Excel Trading Corp. (U.S.A.); J & F Steel Corp. (U.S.A.); JBF Commercial Corp. (U.S.A.); JBF Financial Corp. (U.S.A.); MP Pipe Inc. (U.S.A.); PA Pipe (U.S.A.); Skyline Steel Corp. (U.S.A.); TradeARBED Canada Inc. (Canada); TradeARBED New York Inc. (U.S.A.); TrefilARBED Canada Inc. (Canada); TrefilARBED Inc. (U.S.A.); Ultra Metals Inc. (U.S.A.); Arbed International Trading SA; Almetal Beheer NV (Belgium); Almetal Holding NV (Belgium); Brasilux SA; Considar Europe SA (99.23%); TradeARBED Participations Sarl; TradeARBED Schweiz AG (Switzerland); Van Heyghen Recycling NV (Belgium); Circuit Foil Luxembourg SA (75%); Hein Lehmann AG (Germany; 96.31%); Hydrolux Sarl; (99.98%); MecanARBED Dommeldange Sarl; Soberi International NV (Belgium; 72.86%); Arbed Finanz Deutschland GmbH (Germany; 99%); Arbed Information Systems SA; Alinvest NV (Belgium); Allard Gieterij NV (Belgium); Arfilux Sarl; Brussimo NV; Egemin NV (Belgium; 94.33%); Finindus NV (Belgium; 50%); Immobiliere Schlassgoart Senc; Informabel Holding SA (Belgium); KIV-Kempense Investeringsvennootschap NV (Belgium); Luxengrais Sarl (75%); Plastigran NV (Belgium); SA Luxembourgeoise d'Exploitations Minieres; Sidarfin NV (Belgium); Sidfin International NV (Belgium; 50%); Sidinvest NV (Belgium; 76.57%); Sotel STe Cooperative Esch-sur-Alzette (77%); Sibral Participacoes Ltda (Brazil); Flachform Stahl AG & Co KG; Howard E. Perry; Hughes and Spencer. "Was haben eine WDR-Fernsehserie, ein Fußballstadion in Dortmund und ein Verein schwuler Motorradfahrer gemeinsam? ", fragte kürzlich die Süddeutsche Zeitung in ihrer Kolumne "ABC von NRW". Die Antwort, niemanden wird es überraschen, lautete natürlich: Rote Erde. Eine genauere Klärung des Begriffes blieb die Verfasserin dem Leser allerdings schuldig. Was nicht etwa daran lag, daß die Zeitung in München erscheint, wie böse Zungen vielleicht behaupten würden. '-rad', '-reut', '-ried' usw. in der Tat ab von 'roden' (ahd. riuten) und verweist in der Regel auf den Landesausbau im Verlauf des 12., 13. und frühen 14. Jahrhunderts, als landwirtschaftliche und technische Basisinnovationen sowie günstige klimatische Bedingungen in ganz Europa zu einem außergewöhnlichen Bevölkerungsanstieg führten, der erst durch die Pestepidemie von 1347/48 wieder einen deutlichen Einbruch erlitt. Gerodet wurde also nicht nur in Dortmund, doch nur hier entwickelte sich der Begriff bereits im ausgehenden Mittelalter zu einem Toponym für eine ganze Region. Eine weitere Bedeutungsverschiebung setzte dann im Verlauf der industriellen Revolution ein. Seitdem wird Rot(h)e Erde quasi als Synonym für alles gebraucht, was sich irgendwie unter den durch inflationären Gebrauch bereits reichlich verwässerten Begriff der 'Industriekultur' subsumieren läßt. Rot(h)e Erde wird unter anderem in Verbindung gebracht mit der rötlich schimmernden Farbe des Raseneisenerzes, mit der Arbeiterbewegung, mit einer Maschinenfabrik, diversen Vereinen, der Arbeiterkampfbahn, den Motorradfahrern und nicht zuletzt mit der oben erwähnten Fernsehserie. Über den identitätsstiftenden, metaphorischen Charakter der Rot(h)en Erde scheint jedenfalls kein Zweifel zu bestehen. Doch wo manifestiert sich der Begriff in seiner aktuellen Bedeutungsvielfalt nun das erste Mal, bevor er zum populären Allgemeinplatz wurde? Oder anders gewendet: Wer war so dreist, unter Marketing-Aspekten sollte man vielleicht besser sagen: so clever, den bekannten, historisch gewachsenen Begriff erstmals für sich selbst zu reklamieren? Es wird dem Dortmunder Lokalpatriotismus hoffentlich keinen Abbruch tun, daß die Wurzeln dieser Entwicklung nicht etwa in Westfalen zu suchen sind, sondern dort, wo die Industrialisierung Westdeutschlands ihren Ausgangspunkt hatte, nämlich in Aachen. Genau genommen beim Aachener Hütten-Aktien-Verein Rothe Erde. Wie bitte?! - Inzwischen bedarf es für die Feststellung, daß Aachen zu den ältesten industriell geprägten Kulturlandschaften Deutschlands zählt, ja eigentlich keines besonderen Nachweises mehr. Nur der Vollständigkeit halber sei deshalb noch einmal darauf hingewiesen, daß das Umfeld der westlichsten Großstadt Deutschlands zur Mitte des 19. Jahrhunderts bereits über eine blühende Industrielandschaft verfügte, als man in Dortmund gerade erst damit anfing, mit den neuen Wirtschaftsformen des beginnenden Industriezeitalters zu experimentieren. Die Gründe für diese Entwicklung sind bekannt: Natürliche Standortvorteile wie Kohle- und Erzlagerstätten, Waldreichtum und Gewässer bildeten hier bereits im Mittelalter die Voraussetzungen zur Entstehung einer fortgeschrittenen protoindustriellen Gewerbelandschaft. Man denke in diesem Zusammenhang nur an das Eisenhüttenwesen in der Eifel, die berühmten Aachener Tuche und die zeitweise weltbekannte Stolberger Messingproduktion. Seit der französischen Besatzungszeit war die Region mit modernen Verwaltungsstrukturen versehen. Und schließlich ist auch noch die Nähe zum gewerblich fortgeschrittenen Lütticher Raum zu nennen. Nicht selten vermittelt durch französisches, wallonisches und englisches Know-how und Kapital entstand hier bis zur Mitte des 19. Jahrhunderts ein frühindustrieller Komplex mit zahlreichen bedeutenden Unternehmen der deutschen Schwerindustrie. Dazu gehörten, um nur die bekanntesten Beispiele zu nennen, die Firma 'Eberhard Hoesch und Söhne' aus Düren, die 'Phoenix, anonyme Gesellschaft für Berg- und Hüttenbetrieb', das aus dem Schleidener Tal stammende Röhrenwalzwerk Poensgen, sowie die 'Stolberger Spiegel-Manufaktur', die erste deutsche Niederlassung des französischen Glaskonzerns 'Compagnie de Saint-Gobain'. Eine zusätzliche Dynamik erhielt diese Entwicklung noch durch den Bau der Rheinischen Eisenbahn im Jahr 1841, die als wirtschaftlicher Leitsektor zugleich eine Hochkonjunktur für Eisen und Stahl nach sich zog. Gerade diese Aufbruchstimmung blieb aber nicht ohne Folgen, als die etablierten Werke ihre bisherigen Abnehmer zu Gunsten des lukrativeren Eisenbahngeschäftes vernachlässigten. Drei Pionierunternehmen der rheinischen Frühindustrialisierung waren hiervon ganz besonders betroffen: Die 1838 von dem Belgier Pierre Pauwels und dem Aachener Hubert Jakob Talbot gegründete 'Eisenbahnwaggon-Bauanstalt Talbot', die 1830 gegründete Dampf- und Textilmaschinenfabrik 'Neuman und Esser' sowie die 1833 in Aachen etablierte älteste Dampfkesselfabrik Deutschlands 'Jacques Piedboeuf', deren Gründer ebenfalls dem belgischen Raum entstammte. Um unabhängig von Lieferengpässen und steigenden Preisen den Eigenbedarf zu decken, entschlossen sich die Besitzer kurzerhand, ein eigenes Walz- und Hammerwerk unter dem Namen 'Piedboef & Cie.' zu betreiben. Zu diesem Zweck wurde 1845 ein bei Aachen gelegenes Landgut erworben. Der Name des Landgutes lautete: Rothe Erde. Zwei Jahre später wurden hier die ersten Puddelöfen in Betrieb genommen. Verantwortlich für die Errichtung war der aus der Eupener Textilindustrie stammende Reiner Daelen. Nach seiner 'Lehrzeit' beim Dürener Walzwerk 'Lendersdorfer Hütte' von Eberhard Hoesch sollte die Einrichtung des Hüttenwerks von Rothe Erde nach belgischem Muster nun Daelens Meisterstück werden und seine glanzvolle Karriere beim Hörder Verein begründen. Rothe Erde gab - und gibt - es also auch in Aachen. Doch wie gelangte sie nun nach Dortmund? Vermutlich wäre sie es gar nicht, hätten sich die Geschäfte nach den Vorstellungen der Unternehmensgründer entwickelt. Taten sie aber nicht. Bereits ein Jahr nach der Inbetriebstellung setzte die Revolution von 1848 den optimistischen Hoffnungen vorerst ein Ende. Aufträge platzten, Bestellungen der Eisenbahngesellschaften wurden nicht mehr abgenommen. Als schließlich auch noch die Piedboeufsche Waggonfabrik zeitweilig stillgelegt wurde, bedeutete dies auch schon wieder das Ende des Projektes. Dabei wäre es auch fast geblieben. Erst 1851, als die ersten lokalen Konkurrenten bereits daran dachten, Zweigwerke im Ruhrgebiet zu errichten, die sich schließlich zu Zentralen machtvoller Konzerne entwickeln sollten, wagte man den Neuanfang. Diesmal kam der Anstoß von außen. Neuer Geschäftsführer wurde 1851 der Kölner Unternehmer Carl Ruëtz (1822-1881), ein entfernter Verwandter des nordamerikanischen Zweiges der Mallinckrodts, nachdem er sich für 125 000 Preußische Thaler bei den alten Teilhabern eingekauft hatte. Doch auch der Neubeginn stand unter keinem glücklichen Stern. Bereits drei Jahre nach der Wiederaufnahme des Betriebes verlor das Werk mit der Einführung eines Schutzzolles auf belgisches Roheisen seinen bis dahin bedeutendsten Standortvorteil. Als dann im Jahr 1860 die erste von Nordamerika ausgehende Wirtschaftskrise nach Deutschland übergriff, gerieten die Besitzer in Streit. Gegen den bereits etablierten Aachener Industrieadel hatte der 'Ausländer' Ruëtz keine Chance und zog es vor, freiwillig zu gehen. Doch bereits 1861 findet man ihn in Dortmund wieder: Als Käufer der ehemaligen Paulinenhütte, die 1856 aussichtsreich gestartet, dann aber im Verlauf der Krise von 1860 zusammengebrochen war. Der Name des neuen Unternehmens: "Kommanditgesellschaft Carl Ruëtz & Co. zur Rothen Erde". Über die Motive für die Bezeichnung läßt sich natürlich nur spekulieren. Zunächst einmal wird es Ruëtz natürlich darauf angekommen sein, durch die Beibehaltung des bekannten Namens die Beziehungen zu seinen alten Kunden aufrechtzuerhalten. Daß der Begriff auch in Dortmund sozusagen auf 'historischen' Boden fiel, war in diesem Zusammenhang wohl nur ein glücklicher Zufall. Eine Spitze gegen die ehemaligen Geschäftsfreunde wird die Namenswahl wohl ebenfalls beinhaltet haben. In Aachen jedenfalls kochte man vor Zorn über den vermeintlichen geistigen Diebstahl. Noch 1907 wurde der Namenstransfer in einer offiziellen Firmenfestschrift fälschlicherweise Rainer Daelen zugeschoben, dem man die Ehre wohl eher gönnte als dem geschaßten ehemaligen Direktor. Ändern konnte man allerdings nichts. Eine Antwort blieb trotzdem nicht aus. Anläßlich der Umwandlung des Unternehmens in eine Aktiengesellschaft im Jahr 1864 wurde die Firmenbezeichnung nun ebenfalls in Rothe Erde, genau genommen in 'Aachener Hütten-Aktien-Verein Rothe Erde' geändert. Zu weiteren Konfrontationen kam es jedoch nicht mehr. Dafür entwickelten sich die Hütten zu unterschiedlich. Zunächst einmal blieb Carl Ruëtz das Pech treu. Nach einem erfolgversprechenden Neubeginn in Dortmund - 1870/71 beschäftigte das Werk bereits rund 800 Arbeiter und Angestellte - erkrankte er schwer und war seit 1872 nahezu vollständig gelähmt. Als dann auch noch die Gründerkrise über das Werk hereinbrach, war das auch schon wieder der Anfang vom Ende. 1878, nur ein Jahr bevor die preußische Schutzzollgesetzgebung wieder etwas bessere Voraussetzungen für die deutsche Schwerindustrie schuf, gab Ruëtz auf. Er starb am 14.9.1881. Trotzdem war das noch nicht das Ende der Rothen Erde in Dortmund, im Gegenteil. Die Besitzverhältnisse veränderten sich, der Name aber blieb bestehen. 1880 erfolgte die Neugründung des Unternehmens als 'Aktiengesellschaft Eisenwerk Rothe Erde', die sich in den folgenden Jahren zu einem recht bedeutenden Unternehmen der Stahlerzeugung und Stahlverarbeitung entwickelte. 1916 wurde es von der Deutsch-Luxemburgischen Bergwerks- und Hütten-AG übernommen, welche die Gesellschaft als Betriebsabteilung 'Rothe Erde der Dortmunder Union' weiterbetrieb. 1926 wurde diese dann in die Vereinigte Stahlwerke AG überführt. Inzwischen firmiert das Unternehmen als Maschinenbauanstalt 'Rothe Erde GmbH' des Thyssen-Krupp-Konzerns. Und mit dem Erfolg der Hütte wurde auch der Name immer populärer. Der Begriff war bekannt, rechtlich nicht zu schützen, und weckte zahlreiche Assoziationen, die mit der ursprünglichen Bedeutung schon bald nichts mehr gemein hatten. Am bekanntesten ist vielleicht noch die 1926 errichtete Arbeiterkampfbahn Rote Erde, bei deren Namensgebung sich der Architekt Hans Strobel allerdings schon wieder auf die vermeintliche Farbe der westfälischen Erde bezog. Auch in Aachen wurde der Begriff Rothe Erde schon bald zum Inbegriff für eine ganzes Industrieviertel. Die weitere Geschichte der Hütte verlief jedoch wesentlich dynamischer als die der namensgleichen Konkurrenz in Dortmund. Nach der Einführung des Thomasverfahrens im Jahr 1880 unter dem Direktor Adolf Kirdorf, ein Bruder Emil Kirdorfs von der Gelsenkirchener Bergwerks-Aktien-Gesellschaft, nahm die Entwicklung hier einen selbst für deutsche Verhältnisse zeitweise außergewöhnlichen Verlauf. Die zuvor ungünstige geographische Randlage Aachens erwies sich nun als Standortvorteil. Aufgrund der Nähe zu den wichtigsten Erzlagerstätten des Zollvereins im lothringisch-luxemburgischen Minettegebiet konnte man das Roheisen nämlich wesentlich preiswerter beziehen als die Konkurrenz im weiter entfernten Ruhrgebiet. Außerdem war man hier Dank der Forschung an der erst kurz zuvor gegründeten Königlich Technischen Hochschule zu Aachen schon bald in der Lage, aus dem zuvor als minderwertig belächelten Thomasstahl Qualitätsware für höchste Ansprüche zu produzieren. Bereits zehn Jahre nach dem Erblasen der ersten Charge überschritt der Aachener Hütten-Aktien-Verein die Million-Tonnen Grenze an produzierten Rohstahlblöcken. Kein anderes deutsches Thomasstahlwerk hatte zu diesem Zeitpunkt eine solche Produktionsziffer erreicht! Um sich von der Abhängigkeit der Roheisenproduzenten zu lösen, hatte Kirdorf bereits im Jahr 1892 im luxemburgischen Esch ein vollständiges Hochofenwerk mit umfangreichen Erzkonzession erworben. Weitere bedeutende Anlagen folgten im Jahr 1902 im kaum zwei Kilometer entfernten lothringischen Deutsch-Oth (Audun-le-Tiche). Nun fehlte zur vollständigen Autarkie nur noch die Kohle. Und genau hier trafen sich die Interessen des Aachener Hütten-Aktien-Vereins mit denen des bedeutendsten europäischen Zechenunternehmens, der Gelsenkirchener Bergwerks-Aktiengesellschaft. Zusammen mit dem Schalker Gruben- und Hütten-Verein gingen die Kirdorf-Brüder zum 1. Januar 1905 eine Interessengemeinschaft ein, die im Jahr 1907 schließlich in einer formalen Fusion unter dem Dach von Gelsenkirchen mündete. Das Ergebnis war das nach Krupp größte Industrieuntemehmen Deutschlands mit weitreichenden Synergieeffekten für alle Beteiligten. Den Hüttenbetrieben sicherte der Verbund ausreichend Brennmaterial, während Gelsenkirchen für einen großen Teil der Produktion regelmäßige Abnehmer fand. Der umfangreiche Erzbesitz, den Rothe Erde einbrachte, bildete hingegen die Grundlage für die Expansion der Hüttenabteilungen, die wiederum eine Maximierung der Kohlenförderung nach sich ziehen sollte. Rot(h)e Erden. Weniger schmeichelhaft fiel übrigens die lëtzeburgische Bezeichnung für die Bergarbeiter aus, welche sich im Umfeld der Gruben und Hütten entlang der ehemaligen Bauerndörfer Esch, Dudelange und Differdange niederließen. Die 'Minettsdäpp' schufen zwar die Voraussetzung zum Aufstieg Luxemburgs zu einem der größten Stahlproduzenten Europas, doch ging ihr gesellschaftliches Prestige gegenüber der Verwaltungselite in der Hauptstadt auch nicht über jenes der Malocher im Ruhrgebiet hinaus. Im Gegensatz zur Dortmunder Hütte, die ja in gewisser Weise heute noch existiert, konnten die lange Zeit erfolgreicheren Aachener ihren Besitz jedoch nicht wahren. Der Grund dafür lag in den Folgen des verlorenen Weltkriegs. Die Gruben und Hüttenanlagen in Lothringen waren verloren gegangen, und schließlich trat auch noch Luxemburg aus dem Deutschen Zollverein aus, um sich zukünftig Belgien anzuschließen. Unter diesen Umständen entschloß sich Emil Kirdorf zu einem Ende mit Schrecken. Zum Entsetzen der gesamten deutschen Schwerindustrie wurde der Aachener Hütten-Aktien-Verein Rothe Erde zur Jahreswende 1919/1920 an ein französisch-belgisch-luxemburgisches Konsortium unter Führung der Arbed und des bedeutendsten französischen Stahlproduzenten, Schneider-Le Creuzot, verkauft. Auch der Name dieses Unternehmens führte die gemeinsame Tradition der Schwerindustrie Luxemburgs und Aachens fort: Société Métallurgique des Terres Rouges. 1926 wurde sie im Zuge einer Bereinigung der Beteiligungsverhältnisse der Arbed nahezu vollständig von dem luxemburgischen Stahlkonzem absorbiert. Damit hatte die Arbed ihre Produktionskapazitäten noch einmal bedeutend ausgeweitet und einen weiteren entscheidenden Schritt zum Weltkonzern getan. Das Stammwerk in Aachen sollte diese Fusion allerdings nur wenige Monate überleben. Aufgrund der veränderten wirtschaftlichen Rahmenbedingungen hatte es nach dem Ende des Ersten Weltkriegs nie mehr an die alten Erfolge anknüpfen können. Noch im gleichen Jahr wurde es im Rahmen eines Kompensationsgeschäftes der Arbed mit der Deutschen Rohstahlgemeinschaft geschlossen und demontiert. Doch auch dies bedeutete noch nicht das letzte Kapitel in der Geschichte der Aachener Rothen Erde. In rund vierzig Betriebsjahren war ein Abfallprodukt des Thomasprozesses, die Thomasphosphatschlacke, zu einer gewaltigen Haldenlandschaft von zwei Millionen Kubikmetern aufgeschüttet worden. Ein findiger Geschäftsmann erwarb die bis zu 15 Meter hohen Schuttberge, um die Schlacke als 'Echte Aachener Rothe Erde' zu vermarkten. Sportplätze in ganz Europa, darunter die Laufbahnen und Tennenflächen der Olympiastadien von Berlin (1936) und München (1972), wurden in den folgenden Jahrzehnten mit der charakteristischen roten Asche des Aachener Stahlwerks belegt. Der vierfache Olympiasieger von 1936, Jesse Owens, schwärmte noch Jahrzehnte nach seinen historischen Siegen von der Qualität des Belags aus Aachen. Auf die weitere Entwicklung des Werks hatte dies natürlich keinen Einfluß mehr. Während die Reviere in Luxemburg und Dortmund neuen Blütezeiten entgegenstrebten, war die Zeit der Expansion der Schwerindustrie im Aachener Raum, bis auf wenige Ausnahmen, vorbei. Bereits unmittelbar nach dem Entschluß zur Schließung begannen die Demontagearbeiten. 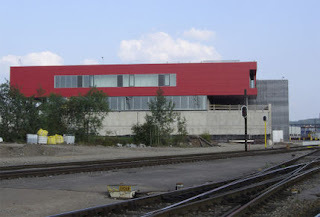 So erinnert heute nur noch das ehemalige Verwaltungsgebäude bei der 'Rheinischen Eisenbahn' an die bedeutenden Impulse, die einmal von Aachen auf die Schwerindustrie an der Ruhr und in Luxemburg ausgingen. Adolf-Emil-Hütte in Esch, Die, in: Stahl und Eisen 33. Jg. Nr 18, 1. Mai 1913, S. 713-745. H. Becker, Aachener Hütten-Aktien-Verein Rothe Erde bei Aachen. Festschrift für den 60jährigen Gedenktag der Inbetriebnahme seiner Werksanlagen. 1847-1907, Aachen 1907. Félix Chomé, ARBED. Aciéries réunis de Burbach-Eich-Dudelange. Un demie-siècle d'histoire industrielle (1911-1964), [Luxembourg 1964]. Paul Emunds, Rauchfahnen - Streikfahnen - Staubfahnen auf Rothe Erde, über Eilendorf, Forst und Nirm (=Beiträge zur Wirtschafts- und Sozialgeschichte einer Arbeiterwohngemeinde, Bd. 2), Aachen 1989. Michael Käding, Geschichte des Aachener Hütten-Aktien-Vereins Rothe Erde, in: Rohstoffbasis und Absatzmark. Die Schwerindustrie des Großherzogtums Luxemburg und das Aachener Revier (=Aachener Beiträge zur Wirtschafts- und Sozialgeschichte, Bd. 2, hg. von Paul Thomes), Aachen 2005, S. 83-142. Monique Kieffer, La reprise du potentiel industriel de la société Gelsenkirchen et la constitution du groupe Arbed-Terres Rouges (1919-1926), in: Les Années Trente, base de L'évolution économique, politique et sociale du Luxembourg d'après-guerre? Actes du Colloque de l'A.L.E.H. du 27-28 octobre 1995, edité par Michel Polfer, Luxembourg 1996 (=Beiheft zu Hémecht). Katrin Pinetzki, R wie Rote Erde, in: Süddeutsche Zeitung, Nordrhein-Westfalen-Ausgabe vom 2. November 2002, S. 52. Wilhelm Rabius, Der Aachener Hütten-Aktien-Verein in Rote [sic!] Erde. 1846-1906. Die Entstehung und Entwicklung eines rheinischen Hüttenwerks, Jena 1906. Rothe Erde, gestern, heute und morgen, hg. vom Eisenwerk Rothe Erde GmbH, Dortmund 1950. Hans Strobel, Die Dortmunder Kampfbahn 'Rothe Erde', in: Bauwelt. Zeitschrift für das gesamte Bauwesen, Heft 33 (1926). Die Industriebrachländer erstrecken sich über eine Fläche von 637.9 ha, von denen 500 ha zu Luxemburg gehören. Die restlichen gehören zu Frankreich. Sie verteilen sich auf 10 verschiedene Standorte, unter anderem dem von Belval-Ouest (zu dt. Belval-West). Die Wichtigkeit der betroffenen Flächen, so wie ihre Lagebestimmung im Verhältnis zu den bestehenden Infrastrukturen, können zum Vorteil für eine neue, grundlegende Ausrichtung der Benutzung des Bodens in dieser Region genutzt werden. Das Brachland in Belval dehnt sich auf einer Fläche von 122.7 ha aus und befindet sich im Süden des Großherzogtum Luxemburg, am Rand der französischen Grenze und rittlings sitzend auf den Gebieten der Gemeinden Esch/Alzette und Sanem. Der Standort ist 17 km von der Hauptstadt entfernt. Bis in den 70er Jahren war die Eisenindustrie der wichtigste luxemburgische Wirtschaftszweig. Mit der Stahlkrise spielte die Schwerindustrie keine vorherrschende Rolle mehr während sich der Dienstleistungssektor in Luxemburg entwickelte. Das Hüttenwerk in Belval wurde von 1909 bis 1912 gebaut und war eines der modernsten Werke Europas. Sie umfasste eine Fläche von 200 ha und konnte 6 Hochöfen ihr eigens nennen. In den Walzwerken des Hüttenwerkes stellte man Gerüste, Schienen, profilierte Metalle und Eisendrähte her. Über 2000 Arbeiter waren 1912 im Werk tätig. Von 1965 bis 1979 unterlag das Werk groβen Veränderungen: Die alten Hochöfen wurden abgerissen und durch die neuen Hochöfen A, B und C ersetzt. Die Regierung und die ARBED (heute Arcelor-Mittal) haben am 24 April 1996 beschlossen, eine gemeinsame Gesellschaft Hochöfen A & B Gesellschaft zur Umwandlung der verlassenen industriellen Standorte zu gründen. Seit 1999 hat eine Gruppe deutscher Experten ein „Masterplan“ Projekt für den Standort Belval ausgearbeitet. Terre-Rouge (zu dt. „Roter Boden“) und Rodange). Agora wurde Besitzer der Gelände der ARBED und versichert deren Entwicklung und Kommerzialisierung. Sie ist mit der Planung betrefflich der Umsetzung der Projekte die ihr anvertraut wurden und deren Ausführung auf urbanistischer Ebene beauftragt. Die wichtigen Veränderungen der luxemburgischen Eisen- und Stahlindustrie seit Anfang der 90er Jahre – Übergang des Gußes zur Elektronik in der Stahlproduktion und Erlass des letzten Hochofens in 1997 – haben die Studie der zur Umstellung der Industriebrachländer, die zu dieser Zeit im Süden des Landes zur Verfügung standen, ermöglicht und notwendig gemacht. Die ersten Nachforschungen ließen eine Aufwertung des Standortes in Belval-West durch die Entstehung einer neuen Industriezone in Betracht ziehen. Doch die soziale und ökonomische Situation, so wie die neuen Perspektiven in Bezug auf die Einrichtung des Gebietes waren die Gründe, die das Projekt zu einer städtischen Bestimmung neigen ließen. Das Projekt kann mit seinen verschiedenen Vierteln bis zu 7,000 Einwohner und über 20,000 Besitznehmer und tägliche Benutzer aufnehmen. In seiner Gesamtheit dehnt sich das Projekt auf einer Fläche von fast 1.3 millionen m² aus, von 69 bebaubaren ha. Dabei sind 30% der Fläche für Grünanlagen und öffentliche Plätze vorgesehen. Damit für den öffentlichen Transport gesorgt ist, wird Belval an das Eisenbahnnetz angeschlossen, die Eisenbahnstation wird in der unmittelbaren Umgebung von Belval-West errichtet. Belval-West ist eine Gegend die sehr stark von der Stahlindustrie gekennzeichnet wurde und war der erste Standort, der von Agora für eine Wiederverwertung vorgeschlagen wurde. Das Projekt Coenen beachtet die Topographie der Orte und basiert seine Auffassung auf bereits bestehende Elemente und auf die bebaute Umgebung. Es gibt dem Geist des Südens Ehrerbietung zurück, beim Plazieren der alten Terrasse der Hochöfen, Zeichen der großen Epoche der Eisenmetropole, im Zentrum eine Einrichtung mit geometrischen Blöcken und indem es ihm den Status eines Monumentes verleiht. Ein technisches Gymnasium ist in Belval-West errichtet worden und kann bis zu 1,500 Schüler aufnehmen. Forschern Wohnungsbauten zur Verfügung zu stellen. Die nationalen Archive werden innerhalb der „Stadt der Wissenschaften“ in Belval-West eingegliedert, wegen der Konstruktion der „Cité judiciaire“ (zu dt. „juristische Stadt“) am derzeitigen Ort dieses Dienstes am „Plateau du Saint-Esprit“ und des Mangels an Platz in den bestehenden Räumlichkeiten. Um die zwei Hochöfen der Fabrik in Esch-Belval wird ein nationales Zentrum der industriellen Kultur eingeführt. Die Terrasse der Hochöfen wird überwiegend durch den Umriβ der industriellen Überreste gekennzeichnet. Die Hochöfen erreichen eine Höhe von bis zu 80 m. Die „Halle des soufflantes“ markiert seine Grenze mit seinem Volumen von 380,000 m³. Die „Möllerei“ erstreckt sich über eine Länge von 160 m östlich der beiden Hochöfen. Die „Stadt der Wissenschaften“ setzt sich aus all dies zusammen und hat eine Gesamtfläche von 27.6 ha und bietet eine Gesamtentwicklungskapazität von 560,000 m². 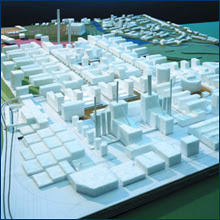 Die Stadt der Wissenschaften, der Forschung und der Innovation ist das Hauptprojekt der Umstellung der Industriebrachländer in Esch-Belval. Die „Stadt der Wissenschaften“ ruht auf einer Sammlung der Sekundarschulen und Hochschulen, der Forschungsinstitutionen, der Verwaltungen des Staates, der kulturellen Infrastrukturen und auch der Unternehmen des Privatsektors am gleichen Standort. Ein Musiksaal für 500 bis 4,000 Zuschauer. Der „Fonds Belval“ wird die erste Institution des Staates sein, die sich auf diesem Standort niederlässt. die archivierten Dokumente vorbehalten ist. Das nationale Zentrum der industriellen Kultur entwickelt sich auf einer Fläche von 3.5 ha. Sein erster Einwand besteht darin, die Hochöfen zu erhalten und das industrielle Kulturerbe als bedeutender Anhaltspunkt der Straβe der industriellen Kultur Saar-Lor-Lux aufzuwerten. Auf dem Standort kommt zudem noch ein regionales Sportzentrum. Die Verwirklichung der Investitionsprogramme des Staates in Belval wird sich über eine Zeitspanne von 15 Jahren erstrecken. In Belval werden die Hochöfen A & B Bewacher der kollektiven Erinnerungen. Am 31. Juli 1997 markierte ein symbolischer Guß das Ende der Nutzung der letzten Hochöfen in Belval. Durch diesen Akt verwandelte sich das, was sich bis zu diesem Zeitpunkt nur als Herstellungswerkzeug betrachtet wurde, in ein Grundbegriff des Vermögens des luxemburgischen Landes. Die zwei Hochöfen, die von 1965 und 1970 stammen, markierten von dem Zeitpunkt an die Landschaft zwischen Esch/Alzette und Belval. Angesichts der Tatsache, dass es sich hier vielleicht um die zwei Schlüsselemente der Zukunft der städtischen Entwicklung von Belval handelt, hat die Regierung beschlossen sie zu bewahren. Die Umgebung der Hochöfen wird der Schaffung des nationalen Zentrums der industriellen Kultur dienen müssen. Es handelt sich darum, ein völlig neues Konzept zu entwickeln, Hochofen B welches diese Zeugen der industriellen Vergangenheit in das städtische Leben des neuen Viertels integriert. Seine Verwirklichung dauerte etwa 30 Monate von der Gesetzesabstimmung bis zur Einweihung im September 2005. Das Gebäude umfasst etwa 14.000 m² und besitzt eine Infrastruktur die an die Akustik der heutigen Musik und an verschiedene andere Vorführungen angepasst ist. Die Rockhalle wird über eine Fußgängerbrücke an den Bahnhof angeschlossen. Zudem sind Parkplätze vorgesehen. Der große Konzertraum der Halle hat 5,400 Sitzplätze und ist größeren Konzerten und Vorführungen vorbehalten. Der kleinere Saal kann bis zu 800 Zuschauer beherbergen und ist für kleinere Vorführungen vorgesehen. Das Gebäude umfasst außerdem ein Reservenzentrum das 6 Wiederholungssäle beherbergt, zwei Aufnahmestudios, einen Tanzraum und einen Multimediasaal. Der „Square Mile“, deren Fläche 20 ha beträgt, ermöglicht eine Entwicklung auf 500,000 m² bebaubarer Fläche. Dieses Viertel mit gemischtem Charakter, befindet sich auf der früheren Sinteranlage und ist in erster Linie dem Dienstleistungssektor vorbehalten. 20% der Fläche sind für Wohnräume reserviert. Jedes Viertel wird durch eine Grünanlage zu den anderen zusammengeführt, das die Zeugnisse der industriellen Kultur integriert: der sogennante Park Belval. Der Park Belval ist der natürliche Übergang zwischen den Vierteln, mit städtischer Eigentümlichkeit und mit einer hohen Dichte, und dem Viertel von Belval mit einer wohnhaften Eigentümlichkeit. Der Park Belval erstreckt sich über ein Gebiet von 33 ha und bietet unterhaltende sowie sportliche Aktivitätsprogramme an. Das Viertel beinhaltet das neue technische Gymnasium und ein regionales Sportzentrum. Das Viertel Belval ist ein wohnhaftes Viertel, erstreckt sich auf einer Fläche von 25 ha und bietet Wohnraummöglichkeiten an für über 7,000 Menschen.